Last week, a few friends and I went to Ô Chalet on Rene Levesque and for the most part it was an enjoyable experience. That evening, one of us was on crutches so we decided to be nice to him and go somewhere in hobbling distance. None of us had eaten at Ô Chalet before so we gave it a shot. After a few days of mulling over the experience, here are my thoughts. The best thing about Ô Chalet has to be the food and the quality of the presentation. The concept is seasonal and the menu is kept relatively simple. I ordered the pulled pork risotto, which was delicious, but I also managed to try the bavette de beouf (it came with a curious side of green pea and mint puree which went well with the beef) and a creamy sweet potato soup. The food was remarkable and the maple glaze for the beef had an interesting little kick to it. The service at Ô Chalet was just okay in the beginning but as the evening moved on, our waiter seemed to lightened up. It was a quiet evening in the restaurant so when we eventually ordered, everything came out fast and fresh. With just two tables busy, our waiter ended up working alone and started pulling double duty at the bar. At the end of the meal, as we paid our dues, we started chatting a little more with the waiter and discovered that the owner has an affinity for fine rum (including Newfoundland Screech – you don’t see that often in Montreal) so we all had a shot which left our throats burning with delight. I can’t imagine it’s much fun working alone (besides kitchen staff) in a restaurant on a Saturday night, but he seemed to be in good spirits as we left. On our way out, I took one last glance around the dining room. The restaurant is divided into “seasons” and there are beautiful elements such as the walls that divide the bar and rest of the space. One wall is cut out to represent trees while the wall other has slim birch trees cut into an opening. This is a creative way to open up the small space. There are a few other modern touches (especially the stools in the bar area and the fireplace) which still manage to evoke a feeling of being away from it all. Then there are the fabric covered benches along a couple of the walls that look like they might have been found in an abandoned chalet. This mixed with the autumn mural that leads into the washrooms was distracting and dated. The tables with chrome legs were not much better and the obnoxious (and in one instance, offensive) wall art hanging throughout the restaurant seemed careless. The décor is the one thing that I’m still on the fence about. I understand the chalet concept, but in some cases, it was almost a little too literal. 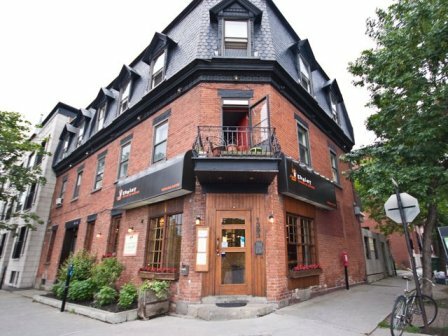 Montreal is a city filled with fine restaurants and I would go back to Ô Chalet because I really did enjoy the food. We ended the evening on a high note and the shot of rum I’m sure helped my friend’s hobble home that much easier. If décor is your thing, I’d keep looking, but if you’re curious about the food, or the rum, I’d suggest trying it at least once.